Local Financial Professionals Stuart Kirsner and Craig Kirsner, MBA Receive Prestigious Sales Award. FLORIDA ‒ Area financial professionals Stuart and Craig Kirsner received a rare honor in January, when they were inducted into Advisors Excel’s Hall of Fame. The ceremony took place during Advisors Excel’s 2018 World Series of Sales Awards Night in Orlando, Florida. To date, the Kirsners are among only 65 inductees out of nearly 1,000 financial professionals associated with the organization. Stuart and Craig Kirsner met the qualifications for this prestigious sales award by doing more than $100 million in cumulative annuity business with the organization — a target that is often a career-long goal for most producers. “Stuart sculpted a national financial practice by building close, trusting relationships with all clients. His son, Craig, is carrying on the legacy his father started,” Advisors Excel Co-Founder Cody Foster said at the induction. “Together, Stuart and Craig make up one of the most passionate father-son duos Advisors Excel has ever worked with, paving the way for thousands of clients toward their retirement dreams. A plaque commemorating this significant achievement will hang in the Advisors Excel Hall of Fame located at the Advisors Excel headquarters in Topeka, Kansas. Stuart Kirsner is the founder of Stuart Estate Planning. He has over 45 years of experience in retirement income planning and life insurance matters with a true “keep it simple” approach. Stuart holds licenses in variable annuities and health and life insurance in Florida. Stuart is widely respected for his ability to explain insurance concepts through a readily understandable, big-picture point of view. He thoroughly enjoys getting intimately involved in various aspects of his clients’ estate planning and retirement income planning. 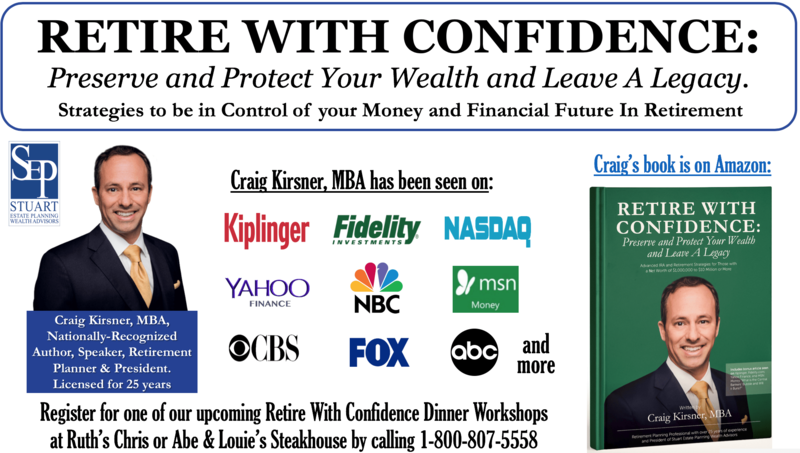 Craig Kirsner, MBA is a retirement planner and an Investment Adviser Representative. He holds undergraduate degrees in finance and risk management from the University of Florida, as well as an MBA in finance from the Chapman School of Business at Florida International University. He has passed the Series 63 and 65 securities exams and has been a licensed insurance agent for more than 20 years. Craig also is a published author, whose book in late 2005 predicted the collapse of the real estate market and the subsequent stock market crash. Craig is committed to every part of his clients’ estate plans being reviewed, attended to, cleaned up, completed and brought up to date in a timely manner. His direct, hands-on approach helps through tough planning decisions. For more information or to schedule a time to discuss your financial future, contact Stuart Estate Planning at 800.807.5558. By contacting Stuart Estate Planning, you may be provided with information regarding the purchase of insurance and/or investment products. Advisors Excel is an independent marketing organization (IMO) founded in 2005 by Cody Foster, David Callanan and Derek Thompson. Based in Topeka, Kansas, the company is independently owned and employs nearly 500 people. Advisors Excel helps independent insurance producers and financial advisors nationwide increase their annuity and life insurance business by providing access to proprietary products, unparalleled training, powerful marketing and lead generation support and a culture in which many of the nation’s top producers can continually refine their skills to better serve their valued clients. Advisors Excel is one of the fastest-growing IMOs ever — growing from $45 million in first-year sales to more than $5 billion in annuity business in 2017.